The signing of free agent big man Kelly Olynyk by the Miami Heat is seen as a way to give the team added strength in the paint, as well as an option to stretch the floor because of his shooting ability. How much his long hair has to do with his skills is debatable, but new teammate Hassan Whiteside decided to poke some at Olynyk’s free-flowing mane. Ira Winderman of the Sun Sentinel wrote about Olynyk’s penchant for physical play and how many opponents perceive his actions on the court as those of a dirty player. One of those past controversies involved Whiteside himself, resulting in his ejection from a game and a suspension for the following contest. That scuffle on March 9, 2015, began when Whiteside shoved Olynyk to the ground, for which the Miami big man was immediately ejected for a Flagrant 2 foul. Despite the heated moment, it was forgotten within hours by both players. 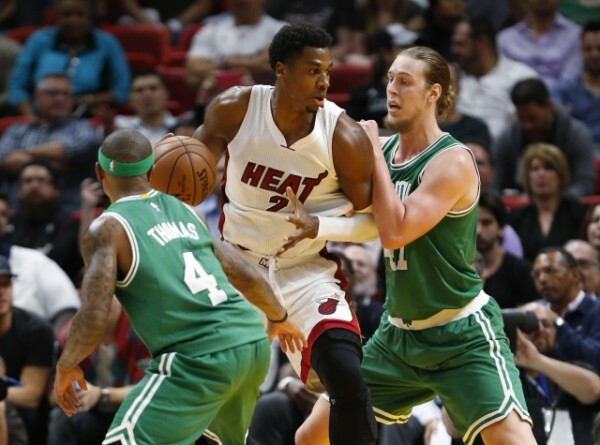 Olynyk’s image around the league became even more controversial after the Whiteside scuffle. In Game 4 of the opening round of the 2015 NBA Playoffs, Olynyk and Cleveland Cavaliers forward Kevin Love both reached for a rebound. The end result was Love dislocating his shoulder and being lost to the Cavaliers for the remainder of the playoffs. Despite being seen as a villain by other fan bases, Olynyk makes no apologies for his style. One Heat player who’s looking to playing with Olynyk is James Johnson, who agreed to a new deal earlier this week. Miami fans used to jeer Olynyk, no doubt focusing much of their venom on his hairstyle. Now, however, they have no preference about which style he chooses, as long as it helps deliver victories for the Heat.